The Orientation to the National Framework for Effective HPN Social and Behavior Change Communication was held in Dhaka on March 31, 2014 for Bangladesh BCC Working Group Members. Mr. Edson E. Whitney, Senior Technical Advisor, Johns Hopkins University Center for Communication Programs (JHU•CCP) facilitated the orientation. Dr. Md. Nasir Uddin, Director (IEM) & Line Director (IEC), Directorate General of Family Planning (DGFP) chaired the orientation and made his remarks. Mr. Abu Hanifa, Divisional Health Education Officer, Dhaka and Mr. Stephen Herbaly, Deputy Director, Office of Population Health, Nutrition and Education at USAID Bangladesh attended as Special Guests and spoke on the occasion. Mr. Edson Whitney described the objective of the orientation. Ms. Rebecca Arnold, Project Director BKMI welcomed the participants and explained the background to the development of the Framework. During the orientation the participants formed in five groups, deliberated and made their presentations and recommendations. A group worked on presenting Implementation Plan for the Framework. Four other groups prepared plans for priority HPN indicators like Young Married Couples, Institutional Delivery, GMP and Child Drowning Prevention and made their presentations. All the presentations from the Orientation are posted here. The framework brochure, its detailed narrative and a brief background to its development are also posted. The Framework consists of strategies and approaches that can be used to align communication activities with GoB policies, strategies and plans. It identifies initial and long-term results of effective and coordinated SBCC. 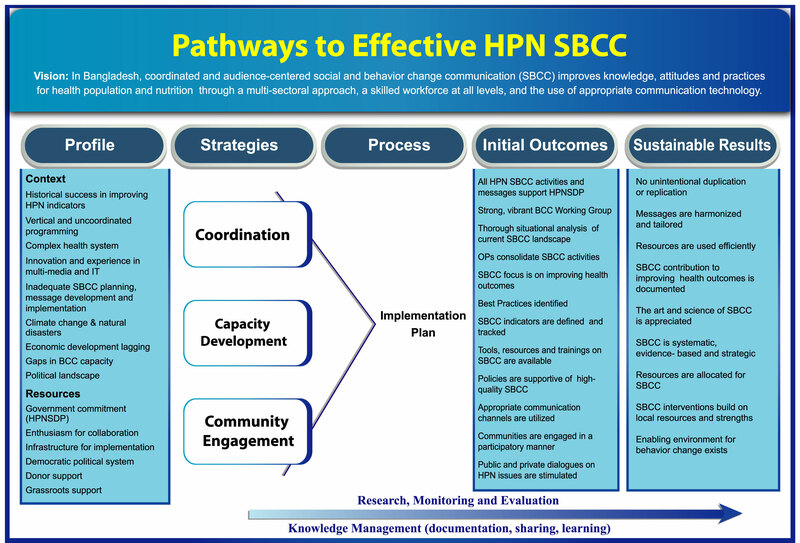 The Framework is flexible and adaptable tools that can be used by any stakeholder to harmonize their SBCC strategies and activities with national priorities.